If you’re not a blogger, you probably don’t know that your comments are blogger GOLD. Whether it’s because we like to promote discussion or we want to show reader engagement to our sponsors, we love your comments. But there are a few easy-to-fix mistakes bloggers make that get in the way of reader engagement and comments. They don’t mean to, they just don’t know they’re making them. 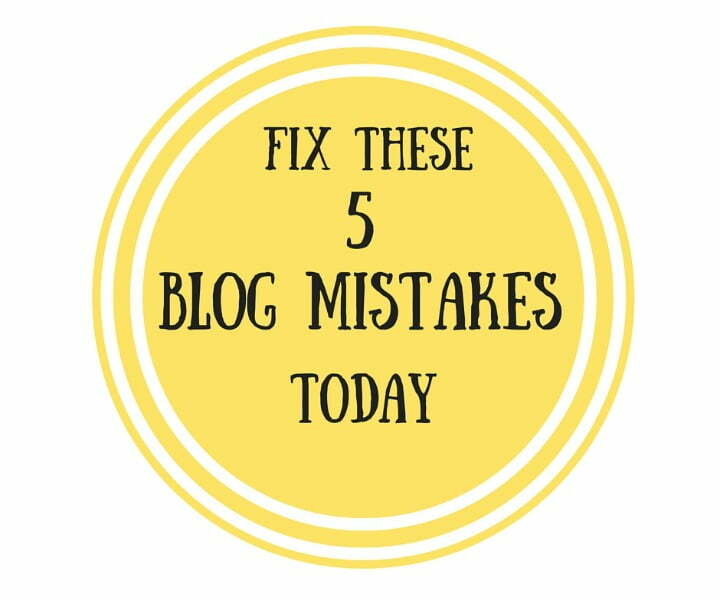 So here are 5 blog mistakes that bloggers can fix today and in the process, improve reader engagement with their site. If a reader can’t easily figure out how to post a comment, they’ll move on. Make the POST COMMENT button super obvious. If it’s too light and fades into a light background, change the color. If it’s dark type on dark background, it’s probably too hard to read. Fix it. And put it someplace obvious. The most obvious location would be at the end of your post. Blogs get more comments if it’s easy to comment. It’s as simple as that. I’m sure it comes as no surprise that pop-ups are annoying. Readers do not want to have to close a window to read your blog or comment. Most often these are pop-up subscription promotions. I am not alone in thinking they are annoying. Find another way to get subscriptions, even if it’s a line and link inserted at the end of every post. To readers, that is. I see quite a few bloggers posting local content in comment-exchange groups that have an international membership. How relevant is a post about Joe’s Auto down the block to readers in India or even Peoria? All comments are not equal: if I were the client, I’d look at those comments from people who will never use my business and think the blogger isn’t doing her job. Bloggers with a passion for narrow topics that are of limited interest, shouldn’t post in comment exchange forums populated by bloggers who really don’t care. Know your audience and go after comments from people who do care. It always surprise me when bloggers post extremely personal anecdotes that are simply purges with no lesson or takeaway message. Your blog is not your private diary. Don’t tell readers that your mother abused you without also telling us how you coped with it or asking for suggestions because you are having trouble coping. A story is just a story unless it teaches the reader something or promotes real discussion about solutions. Save cathartic purges for your journal. Make your blog content educational or meaningful to readers. Bloggers who want to know who is tweeting a post, should make sure their Twitter handle is loaded into the Tweet button so they are automatically notified. If we’re tweeting you, we want you to know, but we don’t want to have to look up your Twitter handle. Mostly because many handles are not intuitive. Easy to do. Five fixes that you can implement today. Make your content relevant and interesting to your audience. And make it easy for readers to comment. Yes, just that easy. Happy blogging! I just said to someone the other day that comments are like gold to bloggers! Very good points and more importantly, very easy to implement. Thanks! I dislike pop ups as well. They annoy me and it makes me want to just close the window. However, many bloggers swear by them that that is the only way they can get people to sign up. I don’t have them but I continue to watch and way the options. So True. Especially the part about the comment section, if it takes me too long I will disregard everything I had to say and move on. Excellent advice, Carol. It always puzzles me when bloggers promote a local event. Great points. I too hate to hunt for the comment button. Those outside of the blogging world don’t understand the importance of comments and I have been told by several they feel intimidated to make a comment. I wish I knew a way to get these readers to comment. I adore what you say about the PURGE with no “ok so here’s the takeaway” from it all. That feels uncomfortable to me. when we learn through sharing I feel empowered and wiser from reading. CARLA recently posted…When saying YES is selfish. I love the last one about adding your twitter handle! I hadn’t thought of that. Thanks for the tips! Wonderful post, Carol. I hate pop-ups too! They really are a blogging pet peeve of mine. I am always conflicted about my popup subscription button. I know it’s annoying, but my subscriptions have more than doubled since I started using it. I do have it set so that it won’t pop up for the same user every time they visit, so I hope that helps. I get so annoyed when people don’t include their twitter handle on their share button! Sometimes I’ll hunt it down, but if I’m in a hurry I just don’t bother. SO much yes! the worst is when you can’t find the comment button! It is often the little things that count that we tend to overlook. Never thought of the Twitter handle thing, but it makes perfect sense to me. Going to see if I can add it to my posts from now on. Should be easy enough I suspect. Thanks for the insight. Thanks! I love comments too. It fun to see if people actually like what you are writing and paying attention. And I didn’t know that about tracking your twitter tweets through your name, very clever! Great tips! This is really practical and applicable. i love it. I thought the part about don’t post personal junk unless there is a message with it. So agree! I agree with some and disagree with some – but that’s what this whole blogging experience is about. If we were all the same it would be pretty boring! These are excellent tips, Carol. I try to be mindful of not purging in my blogs. You are so right, there is a fine balance between too much sharing and just enough so that your reader knows that you have also experienced some of the same issues being discussed. Great points! Thanks for the reminders. Personal Purging is my pet peeve! It’s everywhere, and a huge waste of my precious reading time. I bail out as soon as I realize it’s the bulk of the post. Thanks for pointing these out. It amazes me when people do this. Again. Who are you blogging for? Why are you blogging? Each one of us is different and has different ideas. I call it democracy! Good points! I’ll have to check and see if my twitter handle shows up on the share. I think it does. As for pop-ups…STOP!! I will leave the page, in most cases. I sometimes try to end posts with reminders about commenting and subscribing. I think that’s efficient and doesn’t piss people off. Thanks for sharing this 5 great tops, Carol. I agree with all of them! Thank you for mentioning the popups. I have stood my ground and, no matter what any marketing guru has tried to say to convince me, I refuse to use them. What puzzles me is that they tell me it has made a huge difference in their subscriptions, so someone must like them? Ok, well, here’s a dirty little secret. I subscribe to a bunch of newsletters that I delete instead of reading….hmm…could that be happening? Great point about the comments. I hate it when I want to comment and I can’t find how. Wendy Tomlinson recently posted…Building your mailing list Hangups, tips and stats. Great advice as usual! I can’t wait to hear how the workshop went! Fantastic tips ! I defo need to fix a few things. Great advice. ummmmm….I need to get rid of that pop up window. dammit. You always offer such timely, easily implemented tips, Carol! Just went over my blog to try to fix my mistakes. Thank you! Thanks so much for these tips – I have so so much to learn as a blogger! And this helps….. P.S. I love the way you write! Thanks for this, Carol. I’ve been blogging for so many years but I just checked to see if I had my twitter handle on my blog and wouldn’t you know it…I don’t. I try to stay away from personal purging. Every once in a while, though, I have no doubt I’m guilty of it. Wish Squarespace (my platform) made it easier to tweet and share… and include my Twitter handle on the tweet button. I do get annoyed with pop-ups — especially the “sign-up for my newsletter” ones or those that seem to follow you around the page. And YES make the comment button easy to find! People don’t think of that and many will wander away if commenting is not easy. Great advice! These are all great tips. I hope I don’t purge too much in my posts! Great tips. I agree on the pop ups!! I will have to look into the Twitter idea…that will take some research for me! I love these, especially don’t use your blog to purge. I actually do have a pop-up, but my designer said it’s subtle LOL and I think only shows the first time you visit. Funny! I was just thinking about how much I fall down when it comes to networking through commenting on other’s blogs. I’m usually pretty good at getting back with those who comment on my blog, but can quickly fall short when it comes to leaving comments on other blogs. I’m getting better though, because comments ARE such a vital life line for bloggers!! Thanks for the reminder! These are excellent! I am definitely guilty on a couple of these and I will start to implement ways to change them very soon. Also, you are definitely not alone in disliking pop-ups. They are extremely annoying, especially on mobile devices. Excellent tips, Carol. Thanks for the good advice, especially about the Twitter handle. I keep harping on that one, but so many people still don’t get it. Major pet peeve! This Blog Mistakes post hits the nail right on the head! I too dislike pop-ups. And I absolutely agree about oversharing very private stories that don’t incorporate a teachable moment or food for thought. And you are absolutely right that local content does not belong in international blogger comment exchange groups. Thank you for your Twitter suggestion. I will look into it pronto, but I’ll probably need to call in my techie guy to help me implement it as I don’t know how to make that happen! Comments not only make your blog more searchable but it is also makes it look more attractive because others are engaging with it. Great tips. I’m going to try to add my twitter handle. Comments really are such a validation to my writing, giving me the incentive to go back to the writing desk over and over. Golden motivator for sure! Good tips, especially the one about this not being your personal diary. I cannot tell you how many blogs I come across that I don’t comment on or engage with because it’s full of negativity and I feel like my comment would be the same as the one above. These were simple and practical tips to implement; though I don’t mind a pop-up when it is non-intrusive 🙂 Thanks for sharing these tips. I have actually been debating on putting a popup email subscription on my blog. I have seen a lot of bloggers post about how it’s better and will get you more subscribers. But, like you, I find it annoying. How do I go about put it below in every blog post instead? That sounds like a better idea. I am on blogger. As someone who has just started a blog this is good advice. Thanks for sharing. Good points to consider. I have comments turned off at the moment, for several reasons. If you had to think of a reason not to have comments on your blog, what would it be? ADVICE FROM A COP recently posted…What’s the Problem with Medical Marijuana? These points are all useful, especially the pop up thing – I don’t know anyone who likes them. Regarding the personal purge issue, although I don’t like those kind of posts myself I would never advise people not to write them. I simply click away from them or avoid them if it is obvious what they are. Although those kind of posts may seem self-indulgent, I am aware that there are many lonely people out there with no one to talk to. Especially people with mental health issues. If they get relief from purging publicly, I think that is a good thing for the writer – I would not want to make those people feel there is no place for them or make them feel ‘wrong’ for doing it. No body ‘owns’ the Internet and people are free to write whatever they want. Even if there is no guidance or advice with a purging post, it may still be beneficial to others who have felt alone with the same problem or experience. Although the really misery filled, self-indulgent posts annoy me on a certain level, I try to think of the person behind them and consider that shouting into the vast space of the Internet maybe feel like their only choice to be heard or feel less threatening than talking face to face with real people. I just wanted to say congratulations! You won the Inspire Me Monday Linky party for most popular post! I love this post!! What is awesome about this is it is so easy to do yet very common to forget. I am going to apply this to my blog and remember to keep up with it! Thank you! !